With the day coming up this Sunday, it’s a good time to look at how often and by what means Americans keep in touch with the eldest members of their families. Among U.S. adults who have at least one living grandparent, 64% say they are in touch with grandparents at least on a monthly basis, including 36% who say they keep in touch with their grandparents at least monthly (but not weekly) and 28% who do so weekly or daily, according to a 2014 Pew Research Center survey. 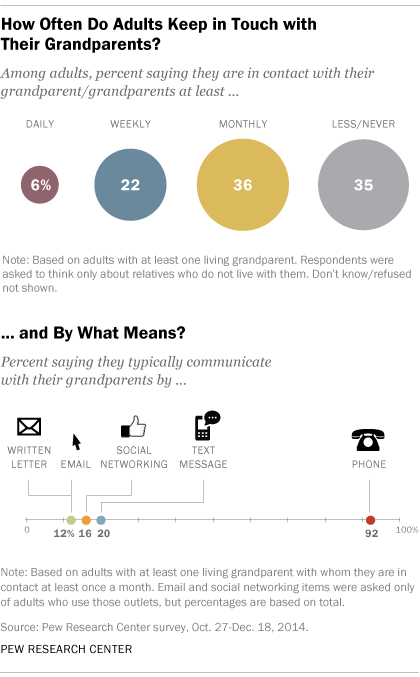 But some adults rarely communicate with their grandparents: 35% of adults with a living grandparent say they communicate less often than monthly, including 2% who say they are never in contact with their grandparents. Phone calls are the most popular mode of communication between adult grandchildren and their grandparents. About nine-in-ten (92%) of those who are in contact with their grandparents at least monthly say they use the phone. Still, about a third (32%) rely on at least one of the newer forms of technology such as text messages, social media or email. One-in-five adults who are in touch with a grandparent at least monthly opt for texting their grandparents; about one-in-six (16%) cite using social media sites, like Facebook or Twitter; and 12% say they keep in touch with their grandparents via email. While many adults rely on technology to stay in touch with their grandparents, pen and paper are not completely obsolete. In fact, the share of adults (12%) who typically communicate with their grandparents by writing a letter is equal to the share that stay in touch through emails. Grandparents report more frequent contact with their grandchildren than grandchildren do with their grandparents. Some 20% of grandparents with at least one grandchild of any age (with whom they do not live) say they communicate with their grandchildren at least every day, while 41% say they do so weekly. Although older Americans tend to adopt technology later than younger adults, grandparents and grandchildren report using similar forms of communication to stay in touch. About eight-in-ten (79%) American grandparents who are in touch with their grandchildren of any age at least once a month say they keep in touch with their grandchildren via phone calls. Text messages are used by a quarter of grandparents who communicate with their grandchildren of any age at least monthly, while 16% use email and 13% connect on social media.